"Permeable" driveways have been around for a long time: gravel, oyster shells, dirt, and sand have provided surfaces that allow rainwater and runoff to filter through to the top layer of soil and keep run-off from nearby streams and rivers. However, these relatively primitive permeable surfaces suffer from compaction and spreading of materials, and need regular grading to avoid washboarding, ruts and potholes. 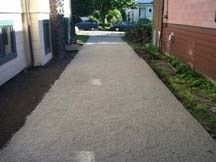 Gravel drives in particular need redressing on a regular basis to replace gravel that sinks into the roadbed substrate. However, if you like the rustic look of a gravel drive, new plastic grid systems such as the EcoGrid from TerraFirma Enterprises can help keep the stones in place while allowing runoff water to filter through to your topsoil. 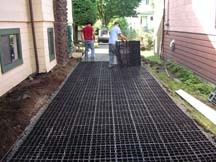 The honeycombed heavy-duty grid is laid over the driveway base of gravel and sand. Then the cells are filled with gravel. If you prefer an even more natural look for an area with infrequent loads, the cells can be filled with soil and seeded with grass for a continuous look to your lawn. If seeding the cells with grass, it is recommended that you lay down an inch or so of soil before laying the grid to allow for expanded root growth. You might want to consider a combination of gravel treadways with a grass center path for a retro look and to help demarcate your driveway path. Larger parking areas or long driveways can be bordered by fencing, hedges, stylish granite posts or other visual cues. The rough surface of the pavers are safer, providing a better grip — especially on hillsides— and reduces the likelihood that water will collect and freeze. Pavers require less maintenance as they are able to accommodate freezing and thawing without cracking. Also pavers will not require a resurfacing treatment like asphalt does. A permeable surface also returns water to the root systems of nearby vegetation rather than shunting it off to a storm drain. Paving stones come in many shapes, sizes and styles. One company, Techo-Bloc offers a wide selection of colors, shapes and textures in its line of pavers for driveways. Pavers that have the look of cobblestones, brick, New England street stones and other styles can add an attractive dimension to the first impression of your home, as well as keep rainwater runoff under control.